Andy, Elizabeth & Bill have always seized any opportunity to kayak or sail. 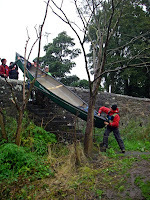 The Moray Club used to have an annual fun weekend at Gorton Sands, Back of Keppoch, when we borrowed a trailer load of OB Loch Eil kayaks to splash about in the tidal channels and skerries under blue skies and blazing sunshine. Who remembers Roshven in a Mediterranean heat wave in 1986? 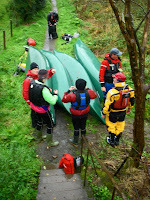 Our ‘floaters’ have joined the Drumchapel & Clydebank Kayak Club. Since then they’ve been learning new skills, exploring the coastline and lochs whenever time, tide and weather allow. However this was different; DCKC had planned to take open canoes on the River Endrick. As this is five minutes from Bill’s door, he couldn’t miss it! 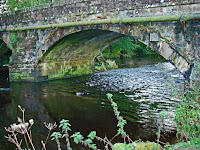 The Endrick is normally a placid pastoral river, frequented by solitary fishermen looking for sea trout or salmon, and by locals walking their dogs along the bank. 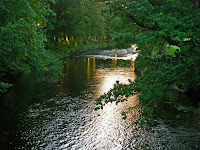 It flows from Carron Reservoir and in its upper reaches is quite wild. On reaching Fintry it becomes more interesting for paddlers (only in high water), before skirting Balfron and Killearn on its way to Loch Lomond. Today’s trip was from Endrick Bridge at Balfron, with the take out just above Gartness. There was however, method in this madness. Both Bill and Rab independently inspected the river the previous day/evening, and were disappointed to discover that it had a very low flow. However there is no substitute for local knowledge! 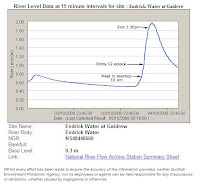 Both knew that the Endrick is a spate river and rises quickly after heavy rainfall; and it was pouring down as we drank our 2nd coffee…. Our ‘delay’ allowed the river to rise 0.3m in 90 minutes! The put in at Endrick Bridge was tricky; and we weren’t even in the water. Never seen a seal launch with an open boat before? Boy oh boy, was it raining hard. 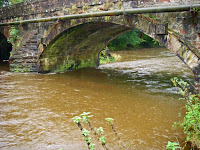 The river was coloured 'milk chocolate', and the rate of flow impressive for such a small river. Compare the colour of the water to the previous day. Our journey was going to be a mix of skills practice, and fun. Launching proved to be both. 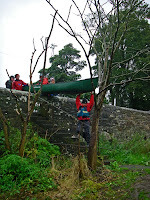 We were soon afloat (4 canoes), and with no mishaps we headed downstream at a fair pace. 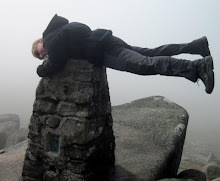 Click here for part 2 of our Endrick 'epic'. Have just looked at this just now ,Bill, its great! Davie hasn't seen it yet but he'll be pleased. Thanks Janice, part 2 will be posted shortly!